On Tuesday, September 3rd, I start the last class of my BFA at Full Sail University. How the time has flown. On March 28th, 2011, I began my journey as a Creative Writing student. I entered the program with insecurity and trepidation, a 26 year old getting a late start on a life’s passion. I hadn’t been in college since 2005 and I worried that the experience would be a repeat of my previous one: feeling out of place, a bobbing head in a sea of faces, and filled with self-doubt. Was I was making the right decision? 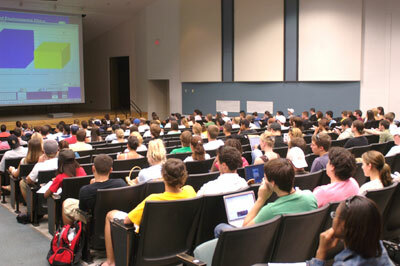 Seriously, if you taught classes this large, would YOU be able to remember the names of everyone? This was small compared to some of the classes I was in at my previous university. I am happy to report that this go-around was NOTHING like my first Bachelors degree. For one, the class sizes were small. I was never in a class larger than 25 students and not only did the teachers know me by name, they KNEW who I was – they knew my fears, my strengths, my weaknesses, and how to help me, as an individual. That was something I hadn’t experienced since high school. I was surrounded by like-minded people: creative types, those with whom I could identify with a passion for words and the art of storytelling. I experienced a kinship that I had long forgotten, like a secret handshake or a unified club of people who embraced their differences from the world. And, unlike my previous Bachelors degree, the environment here was not only conducive to learning, it spawned tenacity, hunger, and enthusiasm for going above and beyond the requirements of the classroom. In my very first core class, Creative Skills Development, I was encouraged to write a story of “any length” to show that I had mastered the skills of basic storytelling. I wrote a 100+ page novella. Never before had I gone beyond the scope of a few pages, and in four short weeks I found myself stretching to my personal limits, expanding a story into what could be one day developed into a full-length novel. Most teachers would have likely discouraged me from this effort, probably to avoid the consequent labor on their end to review it, but my instructor advocated my mission and told me she would read – and give feedback on – every page I was able to put down. Seriously, what other school would do this for me?! You probably think this was only the one class, but time-and-time again, the teachers of my courses went above and beyond for me, helping me with projects long after the final assignment was graded and returned. I’ve kept in contact with many of my professors, some serving as personal mentors to my work, and they continue to take a vested interest in my success and my accomplishments. So it’s with a heavy heart that I prepare for my final class, the last step of a 32-month undertaking that has completely changed my world. While I look forward to a break from deadlines and due dates, I’m going to miss the regimented environment that has nurtured my growth and caused me to produce so much content in such a short period of time. Of course, the relationships I’ve established will remain with me, as will my experiences, so I know that it’s not necessarily the closing of the book – more so a transition into the next novel, the continuation of a grander, more prolific journey than even I can fully picture. ← Bruno Mars in Concert!